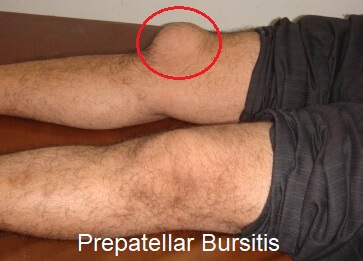 Prepatellar bursitis, also known as Housemaid's knee, is a common cause of front knee pain. It tends to affect people who spend long periods kneeling e.g. tradesmen such as roofers and carpet layers. Housemaid's knee develops when there is inflammation of the prepatellar bursa – a fluid filled sac that acts as a cushion between the quads tendon and the knee bones. There are a number of housemaid's knee treatment options, but the best way to cure it and prevent it coming back in the future is stretches. Ff you want to know more about other treatment options include corticosteroid injections and medication, see the housemaid's knee overview for more information. 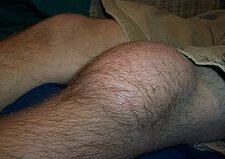 Tight quads often cause and aggravate prepatellar bursitis as they place extra pressure on the prepatellar bursa. Any time you move your knee, more friction occurs at the bursa, which leads to inflammation, swelling and pain below the knee. If your quadricep muscles are tight, stretching is going to be a vital part of your prepatellar bursitis treatment, to help both treat the condition, and prevent it from coming back. There are a number of different ways of stretching the quads muscles, but here you will find my top two quads stretches. They are simple and effective. To get the most benefit from these stretches you want to hold the stretch for thirty seconds and repeats it three times, once or twice a day. Action: Pull your heel towards your bottom until you feel a strong stretch in the front of your thigh. Hold for 30 secs. Action: Pull your foot towards your bottom until you feel a stretch in the front of your thigh. Hold for 30 secs. To get the best results from stretches for prepatellar bursitis, the stretch should feel strong, i.e. rather uncomfortable. However, you should only feel it down the front of the thigh, not anywhere else and it should stop as soon as you release the stretch. With each of these stretching exercises, you want to feel the stretch in the middle of the thigh, not at the knee. That way, you know you are targeting the right part of the muscle. For more tips on the best ways to stretch as well as how to stretch the other leg muscles, see the knee stretches guide. Stretching is just one part of prepatellar bursitis treatment. There are a number of other things that can help. For example, if you spend long periods kneeling, it can help to wear gel knee pads to reduce the friction on the bursa. Other things that can help reduce the pain associated with housemaids knee include ice, medication and injections. You can find out more loads more about other treatment options as well as the common causes and symptoms in the prepatellar bursitis guide.